This section has two subsections viz. Unfiltered and Filtered. 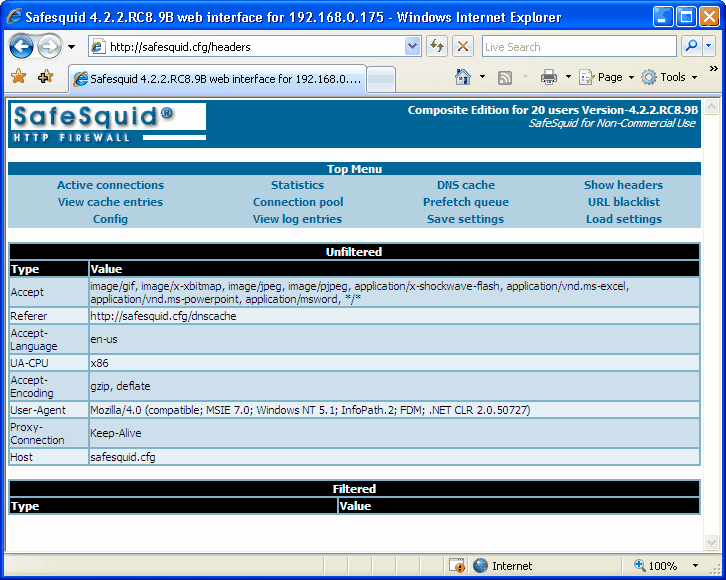 It describes the details of the client (browser) headers. Unfiltered subsection display Type and Value of the unfiltered Headers; similarly, Filtered section display Type and Value of Filtered headers. Accept-Language Specifies the language that is acceptable, i.e. content on pages should be displayed in specified Accept-Language. For example “en-us” specifies that all the pages should be specified in US English. Proxy-Connection The type of connection for the Proxy Server. For example, Keep alive value, keeps the connection alive till it is exclusively switched off. Referer This is the address or URI (Unique Resource Identifier) of the document (or element within the document) from which, the URI in the request, was obtained. Referrer allows a server to generate lists of back-links to documents, for interest, logging, etc. It allows bad links to be traced for maintenance.